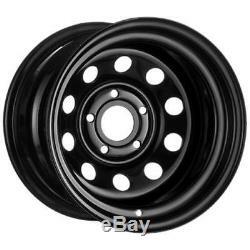 X4 16x10 ET-32 BLACK DEEP DISH MODULAR STEEL WHEELS DISCOVERY 2 5x120. Listing for a set of four 16x10 ET-32 offset Tuff Torque deep dish black modular steel wheels. Fitment Discovery 2 Ranger Rover P38. Please note these wheels will NOT fit any BMW vehicles. Also tracking numbers can be given on request. Note for Scottish Highlands: If your post code is any of the following then extra charges apply as most couriers class the following areas as extended areas: TR21, TR22, TR23, TR24, TR25, FK19, FK20, FK21, G63, G83, G84, HS1, HS2, HS3, HS4, HS5, HS6, HS7, HS8, HS9, IV1-28, IV30-32, IV36, IV40-49, IV51-56, IV63, KA27, KA28, KW1, KW2, KW3, KW5, KW6, KW7, KW8, KW9, KW10, KW11, KW12, KW13, KW14, KW15, KW16, KW17, PA20-38, PA41-49, PA60-78, PH3-11, PH15-26, PH30-44, PH49-50, ZE1, ZE2, ZE3. Please call for a quote if you postcode is above. We do not accept Cheques or Postal Orders. If you wish to collect your item we also accept cash on collection. The purchaser is responsible for ensuring return of goods and resulting expenses. Goods will not be accepted if they are damaged in any way. Goods will not be accepted by Tyres Direct Online if they have been fitted or altered in any way. Items inadequately protected/wrapped will not be accepted for return, or a charge may be made to rectify. 15x10 BLACK DEEP DISH MODULAR STEEL WHEEL ET-32 JAP FITMENT 6x139.7. 16x7 BLACK MODULAR STEEL WHEEL 6x139.7 ET00 - JAP FITMENT. X4 16x7 BLACK MODULAR STEEL WHEELS 6x139.7 ET00 - JAP FITMENT. 16x10 ET-32 BLACK DEEP DISH MODULAR STEEL WHEEL LAND ROVER 5x165.1. For our latest news & offers plus monthly price draws. 08:30 - 17:00. 197 Camford Way, Luton Bedfordshire, LU3 3AN UK. The item "X4 16x10 ET-32 BLACK DEEP DISH MODULAR STEEL WHEELS DISCOVERY 2 5x120" is in sale since Thursday, December 6, 2018. This item is in the category "Vehicle Parts & Accessories\Car Wheels, Tyres & Trims\Rims". The seller is "tyres_direct_online" and is located in GB. This item can be shipped worldwide.